Can a lip balm make you smile? We think so. That's why we invented this one. 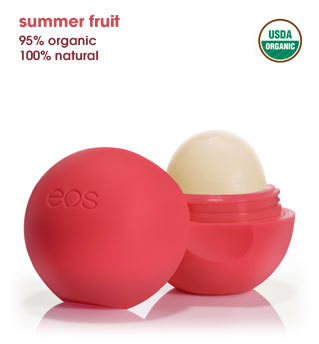 eos has got to be the funnest lip balm I have tried! I love how it is organic, all natural and I don't cough when I use it. Have you ever had lipbalms or lipsticks that make you cough from the chemicals in them? Maybe I am hyper sensitive but I just can't stand all of those nasty chemicals on my lips! The smooth sphere is such a great way to apply lipbalm without getting your dirty finger in a lipbalm pot, or having to use a simple thin stick that barely covers your lips. Their fragrances are wonderful too! The sweet mint makes your lips tingle! The honeysuckle smelled so yummy, yet mild enough that other people aren't looking at you strangely. Visit eos online for more great products! We fight over these at our house! We LOVE them! I give them to the kids in their stockings and Easter baskets just so they'll leave mine alone. Goes on way too thin. Try Buddha Balm for a really great lip balm. If you can't find locally, try online at buddhabalm.com. Yes I agree, Your lips, like the rest of your lips require defense against the sun's harsh ultraviolet rays.